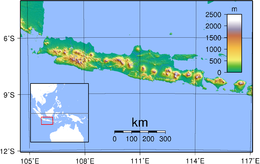 Java (Indonesian: Jawa) is an island o Indonesie. Wi a population o 135 million (excludin the 3.6 million on the island o Madura which is admeenistered as pairt o the provinces o Java), Java is the warld's maist populous island, an ane o the maist densely-populatit places on the globe. Java is the home o 60 percent o the Indonesie population. The Indonesie caipital ceety, Jakarta, is locatit on wastren Java. Much o Indonesie history teuk place on Java. It wis the centre o pouerful Hindu-Buddhist empires, the Islamic sultanates, an the core o the colonial Dutch East Indies. Java wis an aa the centre o the Indonesie struggle for unthirldom durin the 1930s an 40s. Java dominates Indonesie poleetically, economically an culturally. Fairmed maistly as the result o volcanic eruptions, Java is the 13t lairgest island in the warld an the fift lairgest island in Indonesie. A chain o volcanic muntains fairms an east-wast spine alang the island. It haes three main leids, tho Javanese is dominant, an it is the native leid o aboot 60 million fowk in Indonesie, maist o whom live on Java. Maist o its residents are bilingual, wi Indonesie as thair first or seicont leids. While the majority o the fowk o Java are Muslim, Java haes a diverse mixtur o releegious beliefs, ethnicities, an culturs. Java is dividit intae fower provinces, Wast Java, Central Java, East Java, an Banten, an an aa twa special regions, Jakarta an Yogyakarta. Java lies atween Sumatra tae the wast an Bali tae the east. Borneo lies tae the north an Christmas Island tae the sooth. It is the warld's 13t lairgest island. Java is surroondit bi Java Sea in the north, Sunda Strait in the wast, Indian Ocean in the sooth an Bali Strait an Madura Strait in the east. Java is almaist entirely o volcanic origin; it contains thirty-aicht muntains fairmin an east-wast spine which hae at ane time or anither been active volcanoes. The heichest volcano in Java is Munt Semeru (3,676 m). The maist active volcano in Java an an aa in Indonesie is Munt Merapi (2,968 m). See Volcanoes o Java. Mair muntains an heichlands help tae split the interior intae a series o relatively isolatit regions suitable for wet-rice cultivation; the rice lands o Java are amang the richest in the warld. Java wis the first place whaur Indonesie coffee wis grown, stairtin in 1699. The day, Coffea arabica is grown on the Ijen Plateau bi smaa-haulders an lairger plantations. 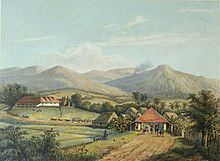 Parahyangan heichland near Buitenzorg, ca. 1865-1872. The aurie o Java is approximately 139,000 km2. It is aboot 650 miles (1,050 km) lang an up tae 130 miles (210 km) wide. The island's langest river is the 600 km lang Solo River. The river rises frae its soorce in central Java at the Lawu volcano, then flows north an eastward tae its mooth in the Java Sea near the ceety o Surabaya. Temperaturs throughout the year average 22 °C tae 29 °C an humidity average 75%. The northren coastal plains are normally hetter averagin 34 °C durin the day in the dry saison. The sooth coast is generally cuiler than the north, an heichland auries inland are cuiler again. The wet saison begins in October endin in Aprile durin which rain faws maistly in the efternoons an intermittently durin ither pairts o the year. The wettest months are Januar an Februar. Wast Java is wetter than East Java an muntainous regions receive much heicher rainfaw. The Parahyangan heichlands o Wast Java receive ower 4,000 mm annually, while the north coast o East Java receives 900 mm annually. The naitural environment o Java is tropical rainforest, wi ecoseestems rangin frae coastal mangrove forests on the north coast, rocky coastal cliffs on the soothren coast, an laich-lyin tropical forests tae heich altitude rainforests on the slopes o muntainous volcanic regions in the interior. The Javan environment an climate gradually alters frae wast tae east; frae wet an humid dense rainforest in wastren pairts, tae a dry savanna environment in the east, correspondin tae the climate an rainfaw in thir regions. Oreeginally Javan wildlife supported a rich biodiversity, whaur nummers o endemic species o flora an fauna flourished; sic as the warld's rarest rhino Javan rhinoceros, Javan Banteng, Java warty pig, Javan Hawk-Eagle, Javan Peafowl, Javan Silvery gibbon, Javan lutung, Java moose-deer, Javan Rusa, an Javan leopard. Wi ower 450 species o birds an 37 endemic species, Java is a birdwatcher's paradise. Houiver, Java is an aa home tae lairge nummers o humans. Wi an estimatit population o 114,733,500 in 1995, Java contains well ower hauf o Indonesie's population. Syne auncient times, fowk hae opened the rainforest, altered the ecoseestem, shaped the landscapes an creatit rice paddy an terraces tae support the growin population. Javan rice terraces hae existit for mair nor a millennium, an haed supportit auncient agricultural kinricks. The growin human population haes put severe pressur on Java's wildlife, as rainforests wur diminished an confined tae heichland slopes or isolatit peninsulas. Some o Java's endemic species are nou critically endangered, wi some already extinct; Java uised tae hae its awn endemic tiger subspecies that went extinct in the mid-1970s. The day, several naitional pairks exist in Java that pertect the remnants o its fragile wildlife, sic as Ujung Kulon, Munt Halimun-Salak, Gede Pangrango, Baluran, Meru Betiri an Alas Purwo. ↑ Ricklefs, M.C. (1991). A History of Modern Indonesia since c.1300 (2nd edition). London: MacMillan. p. 15. ISBN 0-333-57690-X. ↑ "Javan Rhinoceros (Rhinoceros sondaicus)". EDGE Evolutionarily Distinct and Globally Endangered. Retrieved 26 June 2012. ↑ "Indonesia bird watching tour". wildlifenews.co.uk. Retrieved 26 June 2012. ↑ "Doing Business in Indonesia". export.gov. Retrieved 26 June 2012. Wikimedia Commons haes media relatit tae Java. This page wis last eeditit on 23 Dizember 2017, at 03:59.